A group of leading fund managers, led by Aberdeen Standard Investments (ASI), are working with The Big Issue and AML Group to launch a revolutionary mobile-first investment platform that will bring a wide range of social and environmental impact funds direct to a retail audience for the first time. 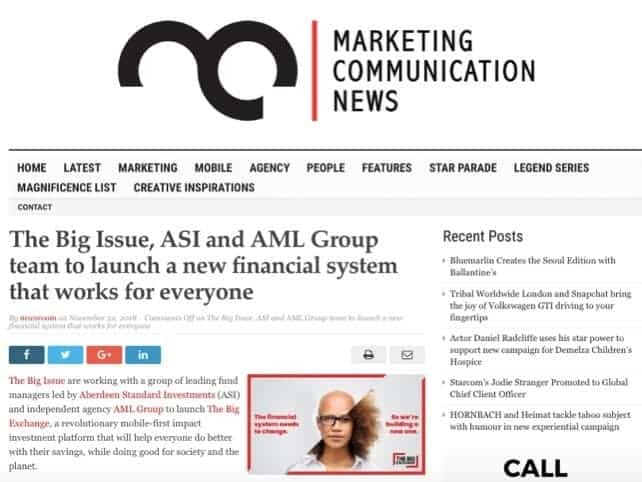 A meeting called by Campbell in November 2017 led to the original concept, which brought together The Big Issue, investment managers, tech Platform builder FNZ, led by Phil Goffin and specialist marketing agency AML Group, led by Ian Henderson. The fund managers will be featured in a ‘movement-based’ marketing programme using advanced consumer targeting (with Experian) via social and digital channels, together with profile-raising PR and advertising activity, coordinated by AML Group. The Big Exchange has received indications of support from major institutions for at least £1 million in funding. 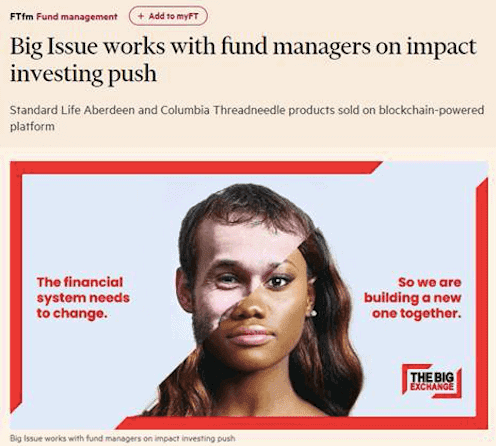 As well as the UK’s largest asset manager Aberdeen Standard Investments, Columbia Threadneedle Investments, AllianceBernstein and Alquity will join as founders and offer their impact funds on the platform.